While much of the focus in the last year has been on those fleeing to Europe, there has been less attention on the overwhelming number of Syrian refugees that have sought refuge in neighbouring countries – primarily Jordan, Lebanon and Turkey. With our colleagues at the United Nation Foundation’s Global Entrepreneurs Council (GEC) , we decided to visit Jordan to understand for ourselves the situation on the ground. There are now over 655,990 Syrian refugees in Jordan, according to estimates by the UN Refugee Agency. For a country of just 8 million, the number is staggering and it’s putting a heavy strain on the national economy, public services and broader Jordanian society. 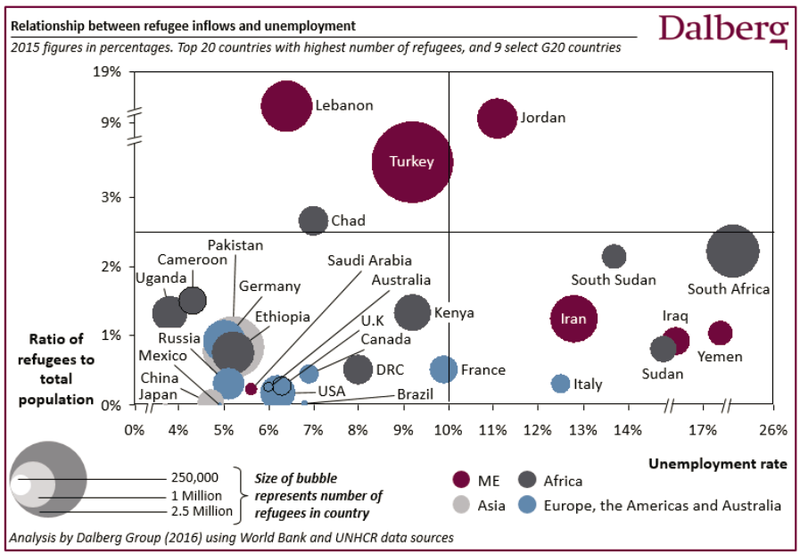 Contrary to the popular perception of refugees, nearly 80% of Syrian refugees in Jordan live in urban areas, not camps. In many respects, it’s preferable to house refugees in urban environments than in camps, as it allows the newcomers better access to the local economy. They can earn money and build a better future. But many Syrian refugees do live in camps; most of them in Za’atari and Afraq, the two largest camps with roughly 80,000 and 54,000 inhabitants respectively. The outlook is hopeful. From a governmental perspective, earlier this year, the Government of Jordan and the international community came to an agreement known as the Jordan Compact, which aims to support Syrian refugees and Jordanian host communities through investments and job creation. At the Za’atari refugee camp, the largest in the Middle East with more than 80,000 refugees, the UNHCR uses a next-generation Biometric Identity Management System (BIMS) to link a person’s iris and fingerprint to their documentation, history and bank account. This allows them to withdraw money from local ATMs via eye scans. 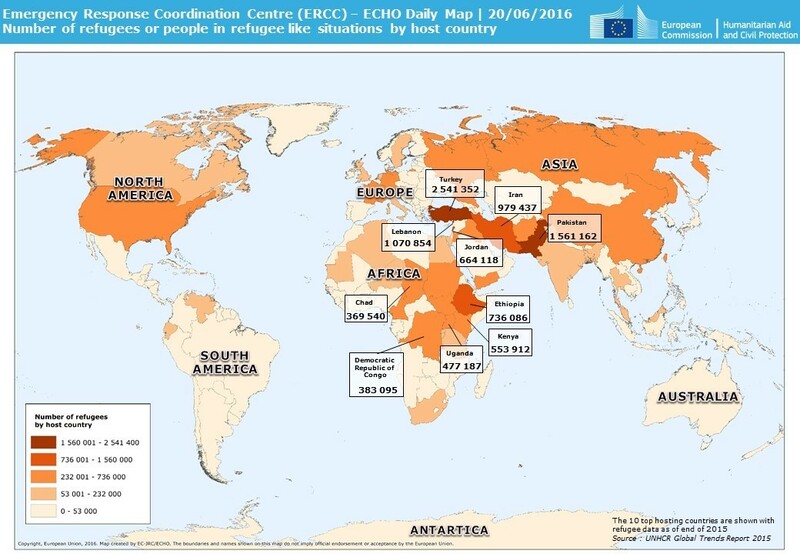 The system has also been implemented across the refugee receptions system, even in some of the most remote regions. To date, over 335,000 refugees have been enrolled into BIMS in five locations. The other technological system that impressed our group was the World Food Program’s (WFP) Cash Assistance Programme . Instead of communal food service, each refugee is given a debit card they can use in the camp’s two supermarkets. The card can also be used outside the camps in selected shops, thereby injecting cashflow into the host society. WFP is using innovative ways to deliver the assistance, such as scratch-cards or e-vouchers delivered to mobile phones by text message. This decentralized system is helping to change the narrative of refugees imposing a strain on host communities, to one of refugees bringing benefits to them. With nearly three-quarters of Syrian refugees in debt of over US$1,000, the need to earn money is critical. The refugee populations within the camps have been remarkably entrepreneurial. In Za’atari alone, more than 3,000 small businesses have sprung up, and this has created a bustling shopping corridor on what’s known as the camp’s Champs Elysees . Here you can find stalls selling bicycles, falafel, bread, household appliances, furniture and more. Additionally, due to the easing of restrictions as a result of the Jordan Compact, there is now a goal to provide 200,000 more work permits to Syrian refugees over the next few years to help improve access to the formal economy. One piece not as widely discussed but just as important is “design thinking”. By listening and empathizing with the refugees, Za’atari’s camp manager, Hovig Etyemezian, is fostering solutions that are far from the bureaucracy you may think of when you hear the words United Nations. For example, the success of the 3,000 Syrian-run small businesses is largely due to refugees driving market-based needs and the UNHCR offering the space to let these micro entrepreneurs set up shop. With a philosophy that values dignity and compassion towards the refugees, many other self-led initiatives are also active in the camp, including important programmes around girls’ education and art. In 2015, the world adopted the Sustainable Development Goals and committed to leave no one behind. One year on, we need to start taking action to deliver on this promise. With our colleagues at the UN Foundation’s Global Entrepreneurs Council, we believe that cultivating entrepreneurial ecosystems will make it easier for those refugees who are newly arrived to find and create jobs. This will alleviate the pressure on the resources of host countries. Despite the formidable work being undertaken by the UN and international humanitarian community to improve lives in Jordan, we should remember that there are more than 65 million displaced persons living around the world today. And with global warming at our doorstep, millions more are expected to become climate refugees in the coming years. Business leaders have a unique opportunity to support humanitarian and development communities as they tackle the refugee crisis and work to prevent future crises. Much more than funding, businesses and entrepreneurs can apply their knowledge and technologies to help meet the needs of refugees in a more sustainable and dignified way. The authors are members of the UN Foundation's Global Entrepreneurs Council and World Economic Forum Young Global Leaders. They would like to thank Josh Slusher, Senior Associate, Global Entrepreneurs Council, for his helping in drafting this article.